8 december 2013, Stockholm, Sweden: Impala Incoming Storm won exc1, CK and Crufts calification! 16 November 2013, Lilleström, Norway: Impala Incoming Storm became Norvegian Junion Winner 2013! Judge: Natalja Skalin, Sweden. 28-29.09.2013: Istanbul, Turkey: Impala American Beauty did it again: CAC, BOB, Best in Group 1 and Best in Show3!! Congratulations Asli, you and Etta make a great team! And in Eckerö, Åland, Sweden, Impala Incoming Storm was EXC 2, judge: Per Svarstad, Sweden. 8.09.2013: Sandviken, Sweden: Impala Incoming Storm VG junior class. Judge: Arne Foss, Norway. 17.08.2013: Norrkoping, Sweden: Impala Jolenne EXC 3. Judge: Annika Ulltveit-Moe, Sweden. 3.08.2013: Sweden: Impala Jolenne CK3! Judge: Frank Christiansen, Norway. 30.06.2013: National show Boras/Sweden: Impala Jolenne won CK, BF3! Judge: Lizbeth Liljeqvist. 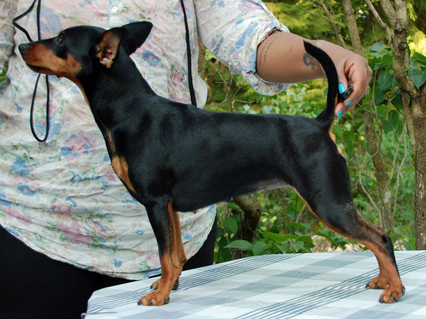 29.06.2013: Boras, Swedish Schnauzer-Pinscher Club show: Impala Jolenne won CK, BF2, rCAC! Judge: Petrea Junehall, Sweden. 9.05.2013, Hagelby, Sweden, Innoficial show: Impala Incoming Storm BOB Puppy!! 30.03.2013: International show Stockholm, Sweden: Impala Jolenne exc3, CK. Judge: Agnes Ganami Kertes, Israel.